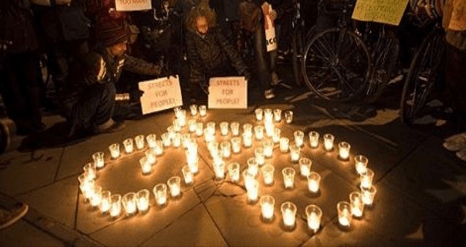 How many more vigils are needed before we get real change to our streets? Photo: SFBP Community Vigil Ride. Editor’s note: it’s positively numbing that I can’t finish writing a piece about two cycling deaths in 24 hours, when a third cyclist is killed, this morning, this time in Pleasanton. Wednesday evening, word came down that a woman was killed in Golden Gate Park while riding her bike. And in a separate incident, a woman was killed in SoMa at 7th and Howard Streets. The names of two three more beautiful people will be added to the sites visited in the next Rides of Silence. Speeches will be given. There will be vigils. Two three more families and groups of friends will endure unbearable absences. For them, the agony never ends. And yet, the legislative priority is to slash fines for motorists blowing through red lights. Tone-deaf law makers boast about making it easier for law-breaking drivers to restore suspended licenses. And every time hard-fought safety measures are put in, our politicians and city planners cow to angry motorists clamoring to roll them back. We know what our city’s streets need; we need the SFMTA to deliver. Ultimately, we need leadership at the top, and Mayor Ed Lee is failing as a leader. Where we need transformative safety improvements and transformative leadership, we have vague promises and a void of action… We need protected bike lanes on JFK Drive. And across SoMa, we need physically protected bike lanes and intersections. These crashes were preventable, and the city should urgently act to see that such tragedies are not repeated. There are too many cars in the city and it is too easy to drive them fast and violently. Every day I observe it getting worse. Every single day is worse than the previous. This is a political problem with a political solution. Golden Gate Park could and should be completely car free. South of Market should have fully-separated and wide cycletracks on every street. But the SF mayor-BOS-SFMTA-SF Planning Commission simply pander to angry motorists and give them more parking. 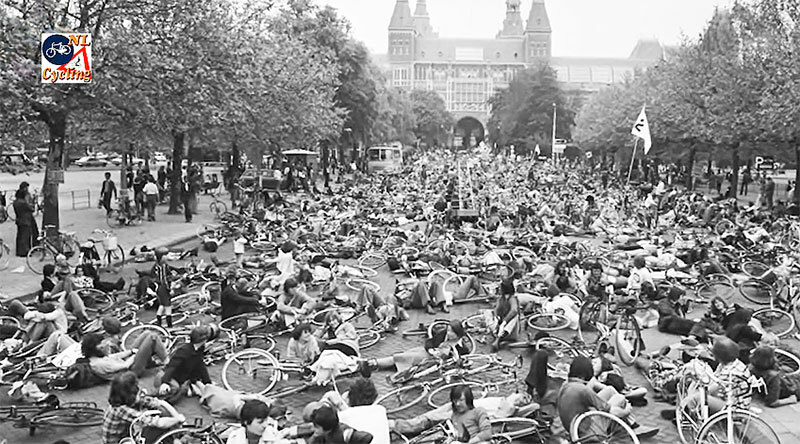 It took protests such as this to get safe infra in the Netherlands. Photo: BicycleDutch Blog. Streetsblog reviewed Henderson’s latest book about bicycle infrastructure in European cities. The Dutch, in particular, have all-but eliminated traffic violence and road carnage. This short documentary about the Dutch experience should be required viewing for every law enforcement officer, planner and politician in San Francisco. There is nothing to figure out about how to make our streets safe. The Dutch and other European nations have already done it, through decades of trial and error that cost many lives. Bay Area planners don’t need to experiment. They don’t have to try things out and see what works. There doesn’t have to be “incremental change.” They can copy what works to make our streets safe. But they don’t. So people keep dying. Why is that? Do Europeans love their children more than Americans do? Why aren’t the streets and parks of San Francisco and Oakland and Sacramento occupied by safe-streets advocates, demanding change? That’s what the Dutch did with their “Stop the Child Murder” campaigns in the 1970s. Meanwhile, Streetsblog reader Jonathan Dirrenberger, horrified by yesterday’s deaths, sent the following open letter to his representatives, SFPD, and to Streetsblog. His experience is, no doubt, nearly universal and exemplifies what’s wrong with our policies, our enforcement priorities, and our streets. I have been living within the same four-block area of Noe Valley for 12 years and have been riding my bicycle every day for the nearly the last 10 years of that time to get to work and otherwise travel around the city for errands, social activities, etc. I am a husband and a father to a toddler, and my wife and daughter are everything to me. And yet at least several times a week, sometimes daily, I have to deal with the existentially nerve-wracking experience of some inconsiderate or oblivious motorist cutting me off (“right hooking” or “left crossing” me), buzzing *way* too close to me, nearly “dooring” me, blocking the bike lane forcing me into fast moving traffic, or just honking at me for doing absolutely nothing wrong other than being on the road and not being in a car. I have had my safety threatened so many times now and yet I have never *once* heard of SFPD doing a “crackdown” specifically aimed at motorists who don’t follow the 3-Foot Law or cut-off bicyclists … let alone those who block the bike lanes or illegally honk at bicyclists for riding as they are supposed to. Further, your police station is smack in the middle of Valencia St where motorists behave with impunity towards bike lanes — double parking in them as if that’s what they were designed for — and making dangerous U-turns and you don’t do a damned thing about it. Add in that Valencia St corridor is one of the most dangerous for bicyclists in the city. Does SFPD simply not care about bicyclists? I get that there is a lot of crime going on in SF right now, but dozens upon dozens of bicyclists are being killed and injured in this city and it is simply unacceptable that SFPD does almost nothing to enforce laws meant to keep bicyclists safe. Just tonight, two more bicyclists were killed by motorists behaving illegally in Golden Gate Park and in SOMA. As a specific example, I often ride down Cesar Chavez. On Tuesday of this week, some oblivious SUV driver drove *into* the bike lane (his passenger-side wheel was completely in the bike lane) while passing me at a high speed and came so close to me that I have no idea how I wasn’t hit. I caught up with the driver at a traffic light: he was messing around with a new tie trying to cut the tag off. Conclusion: he had absolutely no idea that he could have killed or seriously injured me. And this kind of thing happens to me all the time. Yet I’ve never even heard of SFPD putting a cruiser in dangerous spots to try to catch these motorists and issue tickets. I feel like a second-class citizen on my bicycle. I feel like I am considered expendable and that, if a motorist injures me because of their mistake, I will be blamed or, even if the motorist is found at fault, they will be given nothing more than a slap on the wrist in anything but the most egregious cases (just witness SFPD’s disgraceful behavior around the death of Amelie Le Moullac several years ago). They can just say they “didn’t see me” and that apparently resolves them of all responsibility for driving a two-ton machine with 200 hp available at the twitch of a foot through a dense city full of bicyclists and pedestrians. I have no confidence in SFPD’s ability to, first, protect me from dangerous motorists, and second, if I am injured by such a motorist, to act fairly and unbiased to assign blame and issue citations or make arrests appropriately. I feel I am improving my own health and reducing my burden on my fellow citizens by choosing to travel by bicycle and my “reward” is that I am, at best, ignored and, at worst, considered expendable. I would love for SFPD to crack down on the flagrant violations by motorists against bicyclists. You can begin with Valencia St and Cesar Chavez St, but if you want more ideas of “hot spots,” get in touch with the San Francisco Bicycle Coalition. And how about getting some officers to patrol on bicycles to get a taste of what we put up with (knowing that they won’t get the full experience since their uniforms will cause most motorists to be more careful around them)? It’s time to enter the 21st century and get out of this car-centric, anachronistic, 1960s mindset that cities are for cars and not people, and this begins by heavy enforcement of all dangerous motorist behavior including the Three-Foot Law that is supposed to protect bicyclists. The above submission was truncated. SFPD needs a new chief for whom vision zero is a real priority, and who will be held accountable for real progress. And then that person needs political support to do the hard work of creating a culture of vision zero in the SFPD. I’m not sure what SFPD priorities are, but they’re not vision zero. I’m not sure what Ed Lee’s priorities are (besides his “legacy” project of building a basketball arena), but it’s not vision zero. What if we some undercover police officers in unmarked bikes doing some patrols? Please consider protesting these entirely preventable deaths the old fashioned way, by joining Critical Mass tomorrow night at 6 p.m., at Justin Herman Plaza (at the foot of Market Street). Strength in numbers! And that is the core problem: political support. So long as within the great demos of society that bicyclists are “them” instead of “us” getting political support will be hard. This is why parking is continually favored over safety. It is why lower speed limits and red light cameras don’t have broad support. There are some politicians who can see past the windshield. They are unfortunately rare and their careers are often in jeopardy. In my town a council member took a bold stand in support of a road diet which resulted in an enormous improvement in safety for bicyclists and pedestrians. But it also resulted in a minor inconvenience to motorists. Guess who’s voices echoed the loudest in public fora? It nearly sunk the council member’s career. One approach to overcome the majority bias against safety is to face it head on with values based consensus and then convert that into enforceable law. People feel emboldened to shout about merchants losing business due to a specific road reconfiguration at in public meetings. That’s because their rhetoric excludes the missing piece of the puzzle: increased safety. But when the discussion is focused directly on value based tradeoffs like “is it worth losing 20 parking spaces to reduce fatalities by one per decade?” then you take the air out of the anti-safety windbags. One successful example I know of is that Sunnyvale officially established that traffic takes priority over on-street parking. And they seem to have leveraged that to start deploying bike lanes on the dreaded El Camino Real. Lets get the cars out of the park! Of course all the streets in SOMA need a complete makeover we all know that, but it’s going to take a long time before that is all done. Closing the park to cars on the other hand can happen almost immediate. Maybe leave on gate open for disabled placard holders with a 5Mph maximum speed limit. Why in God’s name are there wide avenues through GGP? What the city once considered a sign of modernity and sophistication is, in reality, a way of indicting a city is stuck in another century. With the exception of Crossover, all other roads should be made impassible for through traffic if not made car free altogether. Any single point in the park is accessible by foot with a walk of less than 2 blocks from the perimeter where there is always available parking. Agreed! It’s called a “park” not a freeway. No cars should be allowed in it. Or set up a park-and-ride lot and expand the ADA shuttle. I’d feel a little safer with professional drivers. And another death in Sacramento this morning along Stockton Blvd. formerly Highway 99. But what would Mr. Gunderson say? Thank you, Roger, for this excellent article. Condolences to the families and loved ones for their immeasurable losses. It could be any of us/our families who are now in mourning. Jimbo, that has to be the most vile and disgusting responses the deaths of Heather and Katherine that I’ve read yet. Do you even realize that you’re blaming the victims and defending the assailants? Based on your questionable writing skills, most of us on here think you’re just completely clueless and not too bright. But you should know that when you write inconsiderate and offensive posts like this, people might mistake you for a sociopath. Wearing helmets and paying closer attention couldn’t have stopped either of these tragedies because they were both caused by drivers willfully ignoring the rules on roads that offered no protection for people riding their bicycles. It would have been impossible for the two victims to have avoided these collisions no matter how defensively they rode. When a speeding car flies through a red light or suddenly crosses the lane on a two lane road, there is simply no time for anybody react. Despite yesterday’s tragedy, it’s a myth that riding a bicycle is dangerous. In fact, it’s a magnitude safer to ride a bicycle in the middle of the traffic lane in San Francisco than it is to even walk across the street. The real danger is people ignoring the rules, and our streets not having any safety margin to accommodate for that. Helmets? What about knee-pads and shin-guards? Jimbo, please explain just how helmets *prevent* accidents? Feh! Just about every Sunnyvale proposal to remove street parking in favor of bike lanes is shot down by City Staff, 1/2 of the BPAC committee members, and City Council. Examples are Pastoria Ave. and Homestead. Only a few BPAC members, like Kevin Jackson, are true friends of the Sunnyvale cyclists. Kevin Jackson reminds BPAC and then City Council on these votes that it is official Sunnyvale City policy that transportation (ie, bike lanes) take precedent over parking. He’s thanked for his comments and then they vote for using the road space for parking.